WHMCS is a popular web hosting and automation solution, which includes billing and support options. 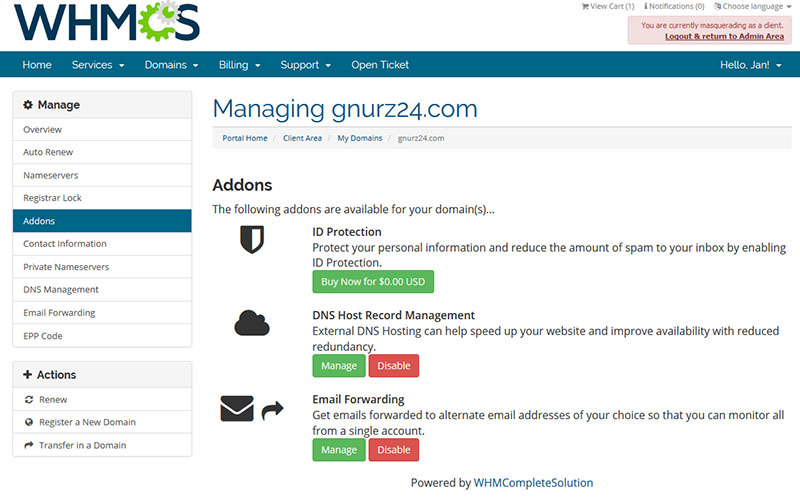 WHMCS can help you with sending invoices and collecting payments for all domain related things, and it can be used for registering and managing domains through many domain registrars and all major web hosting control panels. You can learn more about the features of WHMCS on their website. If you are using WHMCS for your hosting activities, you may interface Joker.com with WHMCS’ domain functionality to easily order and manage domains from within WHMCS. It is free for all Joker.com resellers! Joker.com maintains a registrar module for WHMCS, which offers a great load of features to interface Joker.com seamlessly from within WHMCS. Please refer to our FAQ for details on how to install and use WHMCS with our registrar module. You can always download the latest version of our WHMCS-Module in the official Marketplace for free, or from the Joker.com download page. Previous: Previous post: How to grant domain permissions to others?